I attempt to give you a way to grasp the enormity of the Apple earnings. Listen to the Live NosillaCast on your Roku, AppleTV, Windows Phone and more by clicking on Help over at alphageekradio.com. In Dumb Question Corner, I attempt to find a tolerable answer to James Staple’s question from Twitter: is there a Clarify-Like App for iOS? Next up I explain why you might want a phone number on your lock screen and a couple of ways to accomplish that using Over for iOS or Skitch. A fantastic story about fixing a dead MacBook Pro for only $30. In Chit Chat Across the Pond Bart takes us through Taming the Terminal part 28 of n – Network Troubleshooting. Hi this is Allison Sheridan of the NosillaCast Mac Podcast, hosted at Podfeet.com, a technology geek podcast with an EVER so slight Macintosh bias. Today is Saturday January 31, 2015 and this is show number 508. 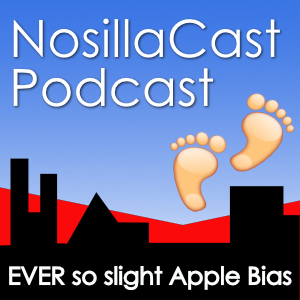 You don’t come to the NosillaCast for financial reporting on Apple but I really want to do some high fives about their latest earnings. I think many of us believed in Apple through the dark years and that makes the latest earnings that much sweeter. I listen to Mac OS Ken and love every minute of it. However the earnings numbers start to all run together after a while. So many millions of earnings, gross margins of such a percentage, earnings per share were expected to be this but turned out to be that, and even the total number of something sold has no meaning after a while. I thought I’d share a couple of things I heard that put the numbers in perspective. When they said that Apple made a profit of $18B, it sounded like a pretty darn big number but it wasn’t until later in the week that it was pointed out that that’s the most profit any company has made. Ever. Seriously. The company that was 2 weeks from bankruptcy did that. Then on the Clockwise Podcast, Jason Snell who is one of the hosts of this half hour show said, “during this show, Apple will sell 17,000 iPhones. But none of those descriptions really brought it home till I heard this one. There are a 7.3 billion people in the world today. Apple sold 74.4 million iPhones. That means 1% of all humans on the planet bought an iPhone. In ONE QUARTER. Now that’s a memorable stat. Ok, enough high fiving, let’s get on with the show! I talk a lot about the live show but did you know that you can listen live at Alpha Geek Radio? This is a service run by Todd Whitehead, and it’s three and sometimes four channels of all geek goodness. When the NosillaCast is live, we’re on channel 3 and often reruns of recent shows are also on channel 3. Todd has been hard at working getting the service available on a ton of devices. You can now get Alpha Geek Radio on Roku, Apple TV, iOS, Android, Windows Phone, BlackBerry, Kindle, Samsung and Panasonic smart TVs, Sons Logitech Ultimate Ears players, and even plain old web browsers! Rather than me explaining how to get to all the Alpha Geek Radio goodness, If you navigate to alphageekradio.com, and have click on “Help” at the top right you’ll find instructions on all of the ways to tune in. I tested this out and clicked on the Roku icon and it took me right to where I could enable the channel on my Roku! So go check out Alpha Geek Radio and get your geek on! Is There a Clarify-Like App for iOS? Remember last week when I had Chris Ashley on the show and I was complaining about Siri because she wouldn’t recognize my daughter’s name (even though it was my fault because she got married and changed her name?) Chris said that on Windows Phone you can assign a nickname, so he has his daughter setup as “Baby Girl”. I was bemoaning the fact that you couldn’t do that on the iPhone. Well that sounded swell but for the life of me I could not find anything in the Contacts app or in Settings for Contacts to enable nick names. I wrote back to Michael and explained that I was going to need a Clarify tutorial to find it, his word description didn’t do the trick. Michael responded almost immediately by creating a Clarify document with a few simple screenshots, some arrows and number sequence buttons to help me follow along. He added some words in each step and a title for each step and hit the button to push the instructions up to Clarify-it.com. Dropped the link back into he G+ Community and now everyone can do it! His instructions were so clear and concise I was able to create a nickname for Lindsay so now when I say, “Call my daughter” for the first time ever, it actually WORKS! Thanks so much Michael. I found out some side effects too which you may or may not like. Once you have a nickname for someone, they show up as that everywhere. If you miss a call it shows their nickname. Got an email from them? It’s shows their nickname. Text message? Yup, shows their nickname. This is cool but in Michael’s case, it means if his wife sees his phone she’ll know he calls her The Evil Queen, so use it at your own risk! If you’d like to help people quickly in a way that’s easy and fun for you, head on over to clarify-it.com and check out the free trial of Clarify. Be sure to tell them where you heard about it when you inevitably buy! RELATED – on security now episode 490 (https://www.grc.com/sn/sn-490.htm) Steve Gibson made the very astute observation that Cameron did not actually call for a back door, but for the ability to get at the data. Backdoors are where you have intentionally weakened crypto (like we talked about the NSA admitting was a mistaken when they got NIST to approve an algorithm with a weakness the NSA knew about). You can have multiple front doors! At that point the crypto is intact, but, you now have a management problem. Technologically, it is possible to have strong encryption and the ability to answer warrants, but, the management of that ability is where the real problem lies. It would be better if no law like this came into being, but if one does, it’s important that we make sure it’s done in a cryptographically sound way, and that there are adequate safe guards to protect from government over-reach. The most obvious signal in the noise is that Seagate are the big losers, their failure rates are an order of magnitude above the majority, but less obvious at first glance is another trend – 3TB drives from most manufacturers are less reliable than 2 or 4 TB drives. After I got off the horn with Bart I thought I should double check the stat on how many iPhones per second Apple sold because I did that one from memory. I think I said 6 per second. Let’s do the math: Tim Cook said they sold 34,000/hour ÷ 60 minutes/hour ÷ 60 seconds/minute = 9.4 iPhones/second. Every second of every day over three months. Sheesh. In other news, I also double checked my new 3TB drive and sure enough it’s from Seagate, and since I bought it about 4 months ago I figure it’s got a good one more month before it dies. Argh.